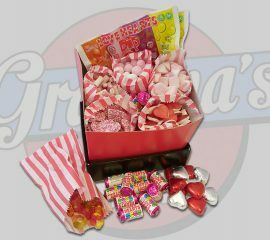 Show that someone special how much you really care with our "Sweet Valentine" Hamper. This hamper contains a selection of sweets from Bonbons to Jellies, Marshmallows to Chocolate Hearts and lots more in between and is the perfect way to show that special just how much they mean to you! 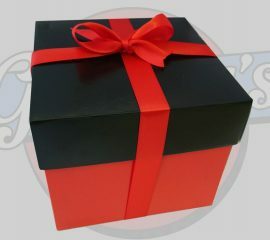 A perfect Valentine's Day Gift! Each hamper contains: 100g x Strawberry Bonbons 100g x Chocolate Hearts with a Caramel Creme Centre 100g x Toffee Bonbons 2 x Love Heart Double Dips 2 x Sugar Mice (because love is sweet right?!) 100g x Pink Candy Hearts 100g x Haribo Heart-Throbs 100g x Haribo Starwberries and Cream 100g x Mini Heart Marshmallows 100g x Mini Love Hearts 100g x Haribo Friendship Rings Each hamper comes in a hamper box measuring 17.5cm x 17.5cm x 15cm and is finished off with a hand tied ribbon bow – making a perfect gift! At times we may be out of stock of a particular sweet (not often), when this is the case we will include a suitable substitute of the same great taste and quality!